I love Korma !!! Love to cook them pretty often as the whole family are too fond of this delicacy . Korma has it’s origin in central Asia . 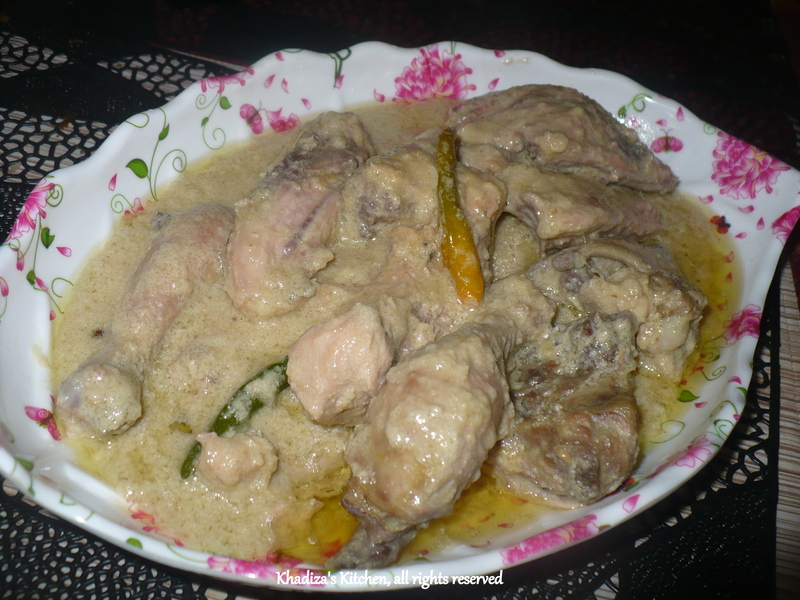 With Mughals , some special Central Asian recipes too, took over the South Asia region , Korma is one of them . 🙂 As time went by , it got too many variations and improvisation , having it’s root in Mughlai quisine. Basically the word “Korma” derived from the Urdu word korma or kormah , meaning braised meat . Urdu “Kormah” derived from the Turkish “kavurma” literally meaning “cooked meat” . The process of braising involves searing of foods at a high temperature and then finished in a covered pot with a variable amount of liquid, resulting in a particular flavor. 1. Heat ghee . Add the whole spices , fry for a while then add the chicken pieces and fry for few minutes . 2. In a small bowl combine onion paste , fried onion , ginger paste , garlic paste, nut paste , poppy seed powder, salt together . Now Add the mixture to the chicken and cook . Cook very well adding small quantity of water little by little , what we call in Bangla “koshano” . When the spices are well cooked add water , enough to make the chicken tender but not too well done . 3. When the water dried out add the cream and milk . Don’t cover with lid . When almost to the desired consistency add hand full of whole green chilies . Add white pepper , nutmeg and mace powder and little sugar. Add the saffron soaked milk. Sprinkle some keora water and turn off the heat . Keep the pot on the stove with lid on , until you serve. 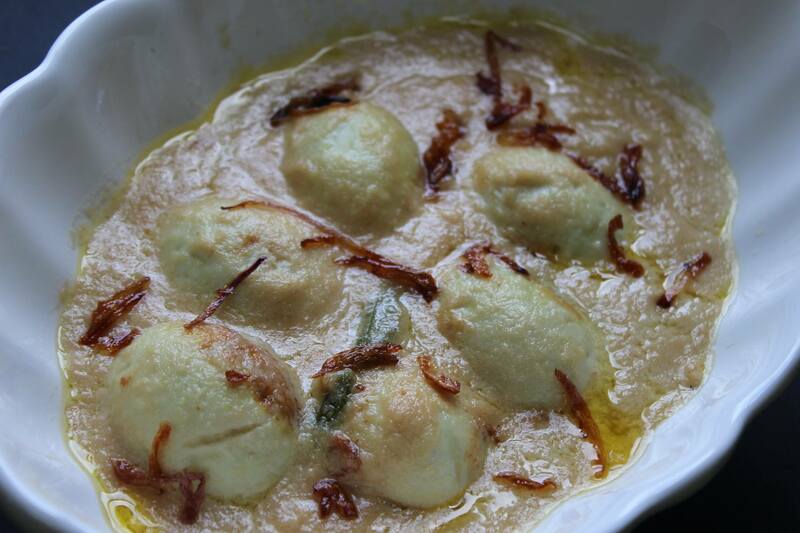 Serve with polau or naan or paratha . 1. To get the best flavor from the mace , please dry roast them for a while befor you grind them. 2. Try to use home made bereshta or fried onion , as it gives you the best result . But remember , don’t over fry the bereshta , they may ruin the color of the korma .